Well it's almost Christmas, and you know what that means, right? You got it, it means there's some poor chav working overtime in a warehouse somewhere, possibly for a company with a river-based name, we don't know. He's constantly shuffling boxes from remote corners of a warehouse into the despatch area, while being chased by giant Christmas puddings, weird little aliens and that big blue monster out of Sesame Street, mumbling something about crappy crates while his supervisor is out of earshot. At least, that's how I imagine Crappy Crates, the 2016 festive release by The Death Squad, was conceived. 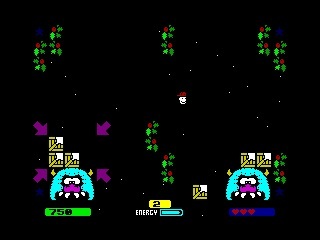 It is, of course, a Sokoban-style puzzler, in which the player must stack crates laden with Christmas crap in the designated pick up area, while being chased by giant Christmas puddings and... you get the idea. It looks nicer than I've made it sound, with all that holly, snow falling in the background, ginormous spiders twice as big as you that follow you around like a clingy ex until you punch them on the nose. (Please remember it's Christmas, and do not punch your ex on the nose, however clingy he or she may be.) 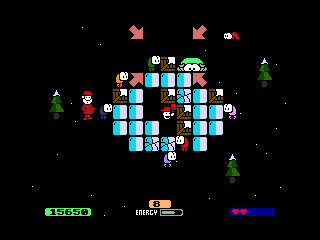 There's even the occasional Christmas cracker power up, which has the bonus effect of detroying all the bad guys on screen at once. And if you want it to look extra nice, you can toggle the ULA+ colour option - not for me though, I was brought up on colour clash (although there isn't any of that in Crappy Crates anyway). It also sounds great in 128K mode with a nice (but lacking in sleigh bells) in-game tune by Yerzmyey and a little shout of satisfaction every time you complete a level. Unfortunately that's not a sound I've heard very much of yet, but it'll be Halloween before I get this review finished if I try to get much beyond level 4 first. It's not that it's too difficult - although the more active the bad guys get, the trickier it gets to complete a level - it's just very time consuming. The major flaw in what is otherwise a very nice looking, potentially fun puzzle game, is that you can only punch upwards. This makes disabling the bad guys awkward, but also means that to move the crates in any direction other than straight up involves a very labour intensive process of constantly swapping places with a crate, then running around to where you started, to rinse and repeat. In places this adds an extra level to the puzzle factor, but with the weird aliens and giant spiders constantly snapping at your heels that's not really necessary. 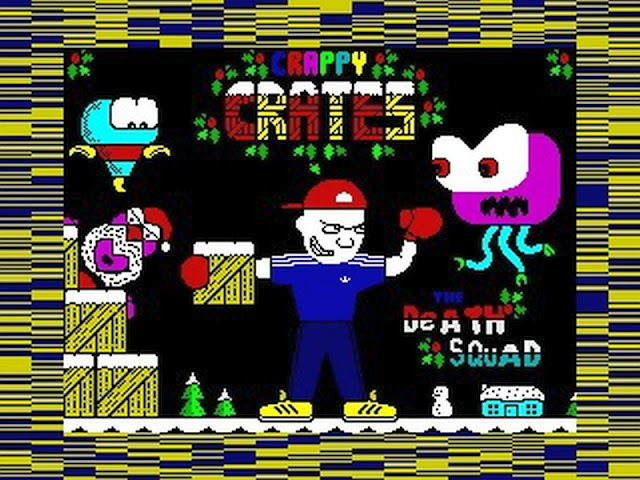 Crappy Crates looks and sounds like the best professionally published Speccy games, and if you like puzzles and have the patience to get to grips with the system of moving crates, this will be a nice bit of festive fun. 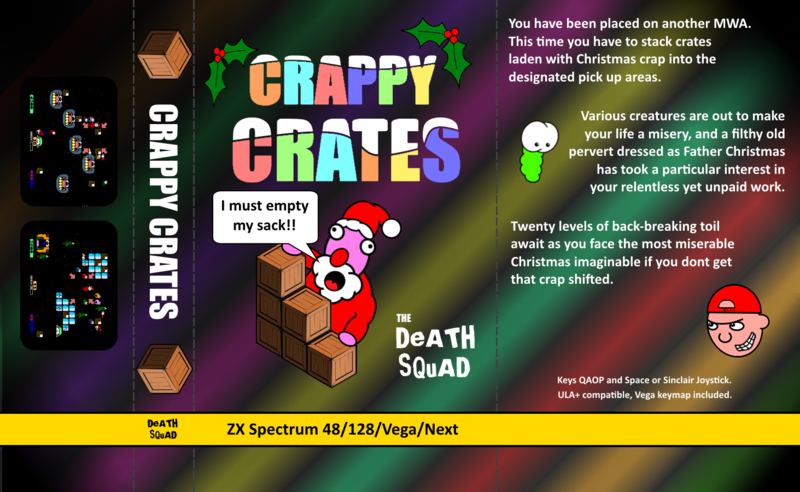 And finally, as a Spec-chum of old, I can only summarise this game one way: It's crap! (In a funky skillo sort of way). 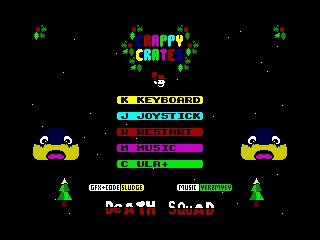 Download the 48k version with inlay and keymaps here. Download the 128k version here.